This article was written By John Berra on 10 Aug 2011, and is filed under Uncategorized. I am sure that VCinema readers all around the world are aware of the senseless riots that have been breaking out across the United Kingdom this week. As widely reported, these riots were initially sparked by the police shooting of a 29-year-old man by officers of the Metropolitan Police Service; a march by approximately 200 people in Tottenham, North London on August 6 being followed by acts of violence. This destructive activity soon spread to other areas of the city and, in the days that followed, to other parts of the country. 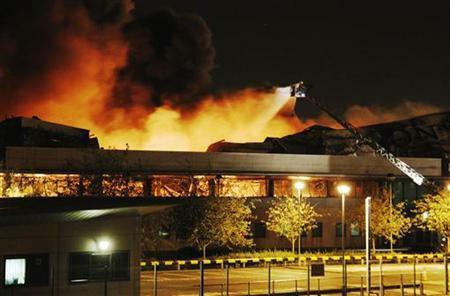 On the night of August 8, a fire was started at the three-storey, 20,000 square metre Sony warehouse in Enfield that held the stock of many independent UK distributors, most of whom have some involvement in Asian cinema through their handling of documentaries and feature films. Although revenue from DVDs has been decreasing in recent years, the home entertainment sector remains the biggest source of revenue for the film industry, and the market is particularly essential to such independent players as Dogwoof, Peccadillo Pictures and Third Window Films. At the time of writing, I am based outside the UK and relying on a combination of online news coverage, email communication and Facebook status updates to make sense of the chaos that is rapidly occurring around my home country. There are obviously social-political issues that need to be discussed in relation to these riots, but as VCinema is a film-related website – a forum that encourages the investigation and understanding of Asian cultures through enthusiastic discussion and friendly debate – we feel that it is our responsibility to make readers aware of the difficult circumstances that independent distributors now find themselves in. We also want to make you aware of how you can support them until matters have been resolved and stock has been replaced. These comments indicate the business model of independent distributors, a strategy which largely relies on the DVD market to generate profit, with the sales of films in the home entertainment market financing the next batch of acquisitions. Cinema releases are a ‘shop window’, intended to increase the profile of such titles, and the cost of prints and advertising often leaves the distributor in the red with profits coming from DVD sales over the course of the next twelve months. Even in an increasingly difficult climate, many of these companies have taken chances on marginal titles, mounting innovative promotional campaigns and putting together excellent DVD packages to bring the best examples of Asian cinema to audiences in the UK. Their releases also appeal to international audiences who often import such titles via Amazon and similar online ordering services. In my intertwined roles as academic and film critic, I frequently deal with representatives of these labels and have found them to be as friendly and helpful as one would expect based on the effort that evidently goes into each of their releases. I cannot speak highly enough of Terracotta Distribution managing director Joey Leung and Third Window Films managing director Adam Torel, who have not merely cultivated a niche market but created a genuine community for Asian film appreciation through events (Asian Movies Meet-Up Nights, East Winds: A Third Window Film Festival, Terracotta Far East Film Festival) and a hands-on approach to corresponding with audiences and journalists. Both companies have become involved with academia through their sponsorship of the Coventry University East Asian Film Society, taking the time to engage with students by speaking frankly about the realities of film distribution and offering students the opportunity to become involved in their activities. To put it simply, there has never been a more appropriate – or more industrially pressing – time to stock up on DVDs of Asian movies, or watch such films online via official platforms. Not all of the companies listed here specialise in Asian cinema, but most have some Asian titles in their catalogues, and all deserve the support of VCinema readers as independents who have continued to operate during a seemingly never-ending recession. Artificial Eye, BFI and Eureka will probably be familiar to readers who regularly explore the classics of Asian cinema due to their wonderful re-issues of films by such legendary directors as Akira Kurosawa, Mikio Naruse, Shōhei Imamura and Yasujirō Ozu, while Revolver has handled more contemporary titles at the cult or exploitation end of the spectrum and Palisades Tartan has re-released many of the modern classics of the ‘Asia Extreme’ era. Peccadillo has released films by Singaporean maverick Royston Tan while bringing queer Asian cinema to the UK and Dogwoof have distributed a number of provocative documentaries from Asian territories. Please use the following links to browse their catalogues and consider ordering some titles to add to your collections, or as gifts for friends or family members. What follows is a list of the companies that VCinema knows to have lost stock to the fire at the Sony warehouse. Further links will be added if we become aware of other companies that were using the facility to store their stock. Aside from being able to order DVDs, many of these companies have titles available for legal download in the UK via iTunes or Mubi. As DVD stock will understandably run low over the next month, please look into these alternative avenues for checking out their films. Everyone involved in VCinema would like to thank you for taking the time to become aware of this horrible situation, and also for any support that you can show towards the above distributors over the coming months.